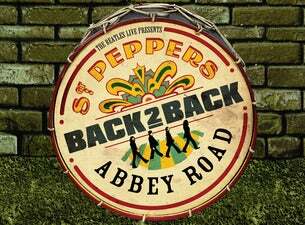 Never performed live in their time, these two iconic albums come to life in their entirety, in original track order with a 15-piece Band and four extraordinary rock performers whose combined experience spans several decades and the vast spectrum of styles the Beatles catalogue demands. May I introduce to you Russell Morris, Jack Jones, Kav Temperly and English folk rock singer-songwriter Jon Allen. The Beatles’ 1967 masterwork of Sgt Peppers created a psychedelic revolution with the dream visions of Lucy in the Sky with Diamonds and Within You Without You and the orchestra grandeur of She’s Leaving Home and A Day In The Life. Two years later, Abbey Road was the epic finale that encapsulated the band’s monumental legacy, from the raw grit of Come Together, the majesty of Something, to the audacious symphonic movement culminating in The End. Featuring an array of Indian instruments including Tabla, Sita and Diruba, Back2Back is the live experience that era never saw: the bookends of the Beatles’ intense, innovative years of studio seclusion performed live in concert. Brought to you by the creators of The White Album Concert, Rubber Soul Revolver, All You Need is Love and Let it Be. Aria Hall of Fame inductee, #1 selling Platinum artist, King of Pop, Australian Icon!! A few phrases commonly used when describing Aussie legend Russell Morris. Shooting to fame in the middle 60’s with Somebody’s Image, Russell had a string of hits including Hush and the Bob Dylan classic Baby Blue. In 1969 he and producer Molly Meldrum released The Real Thing, Australia’s only true psychedelic #1 hit and a song that is played regularly on commercial radio to this day. Constantly in demand, Russell stills tours nationally throughout the year as well as appearances internationally. He has has worked alongside industry heavyweights like Cher, The Bee Gees, Linda Ronstadt, The Beach Boys and toured Australia with the hugely successful “Long Way To The Top”. In 2012 Russell released Sharkmouth, a collection of tunes written about Australian historical characters. Sharkmouth reached #1 on the iTunes Blues Charts & #1 on the Australian Blues Radio Charts. In 2013 he won the 2013 ARIA award for Best Blues n Roots album for Sharkmouth. Eskimo Joe climbed steadily into the hearts of Australians from the day triple j first spun “Sweater” on their airwaves. Successfully straddling mainstream commercial success while managing to keep their Alternative Music roots secure, over their career, Eskimo Joe has racked up a list of impressive stats and awards. Three of the band’s six albums debuted at #1 on the ARIA charts with juggernaut “Black Fingernails, Red Wine” shining for 62 weeks in the Top 50 and “Foreign Land” bringing home 2 APRA Awards for Most Played Rock Song on Australian radio and Best Rock Song of 2010. Eskimo Joe has had 35 ARIA nominations and 8 wins and 25 WAMi Award Nominations with 11 wins. Moving into 2016 and beyond Kav is focused on co-writing with various artists and producers at events such as 50 Songs in 5 Days, mentoring young up-and-coming songwriters and championing his position as an APRA Ambassador. Kav is currently recording and will release his debut solo EP in 2016. Born in New York City, Irwin Thomas (Jack Jones) became a household name in in Australia as a multi - platinum selling artist in 90's band Southern Sons as lead singer/guitarist. Jon Allen has a voice you don’t forget. Just ask Jools Holland, who demanded Jon appear on “Later…” after hearing him on the radio. Or Duffy, who heard his version of “Mercy” and called him in to the studio. Or the millions of viewers of “Homeland” transfixed by his track “Joanna”. Or the BBC producers repeatedly A-listing songs from his 3 albums. Or fans Guy Chambers, or Mark Knopfler, or Jo Whiley, all of whom have been entranced by his trademark mix of catchy tunes and folk- and Sixties-inflected country blues. Jon’s voice comes from the south, but not the south any of the above expected. He was born in Winchester in the South West of England, and then followed the Beatles connection to the Liverpool Institute for Performing Arts, founded by Paul McCartney. Jon has toured extensively, both solo and with his band, appearing with Knopfler, Emmylou Harris, Damien Rice. His most recent album, “Deep River”, contains some of his best work. To Jon, it’s simple. “I just try to write music that moves me. I’m trying to express some truthfulness. There’s no gimmicks, no beeps and whistles.